A debut comic drama novel about a woman who, having been broken up with by her fiancee, moves home to find her family struggling with her history professor father's recent Alzheimer's diagnosis. 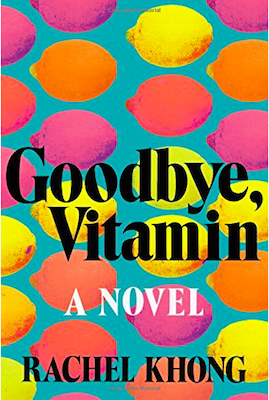 It doesn’t exactly seem like a recipe for a darkly comic yet heartfelt novel, but that’s exactly what Goodbye, Vitamin is. Told in a diary format over the year that Ruth spends at home, Goodbye, Vitamin is a quietly brilliant disquisition on family, relationships and adulthood, told in prose that is so startling in its spare beauty that I found myself thinking about Khong’s turns of phrase for days after I’d finished reading ... It’s refreshing to read female authors — among them, Jami Attenberg, Ottessa Moshfegh, and Marcy Dermansky — who are subverting the longstanding convention of adult men who feel stuck, who are emotionally unavailable, who find adulthood just out of reach, and who are often 'saved' by a woman who has her life together. They, and now Khong, are showing that women can be screw-ups too. Rachel Khong has managed to create an Alzheimer’s novel that is heartbreaking but also funny, offering a fresh take on the disease and possible outcomes both for the person suffering from it and their caretakers ... But the real charm of the novel isn’t the plot so much as the sparkling little details that pop up on every page, illuminating the dark material ... This isn’t melodrama; it’s a novel modeled on real life, where humor often rubs shoulders with pathos, and Ruth’s gift as a narrator is her ability to observe and record it all ... Goodbye, Vitamin never minimizes the difficulty of caring for someone with Alzheimer’s. But it also shows how this care can be rewarding. ...this is a writer who clearly knows how to squeeze the sweetness out of the tart fruit life throws at you ... Khong's endearingly quirky novel, which takes the form of Ruth's diary of her transitional year, is filled with whimsical observations, oddball facts, and yes, even some romanc ... Sweet? Yes. Sugarcoated? Perhaps. Saccharine or cloying? Not to me. Hello, Rachel Khong. Kudos for this delectable take on familial devotion and dementia. What did you think of Goodbye, Vitamin?